Autofeed Rivet Machines and Systems. Milford has been around since the early 20th century. In the early 2000’s they were acquired by Orbitform. Under new ownership and management, the Milford product line has expanded and flourished. 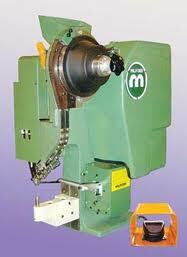 We specialize in auto-feed, impact based riveting systems. We also provide parts and support for legacy equipment, and can offer tooling for Milford and competitors impact machines.